Metered taxis (taksi berargo) are available in Nusa Dua and are a relatively cheap and reliable way to get around, especially at night. Avoid any taxi where the driver refuses to put the meter on. Public transport is far from regular in the area, but some bemos from Tegal terminal in Denpasar do ply the main bypass. 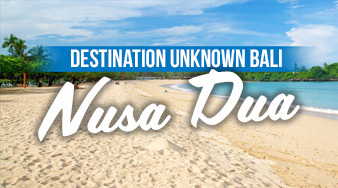 Nusa Dua does not have much of a nightlife. It is known more for its luxurious 5-star resorts where cocktails on the beach are the go.